ダナン婦人科小児科病院 - Da Nang Hospital for Women and Children. ダナン整形外科病院 - Da Nang Hospital for Traumatology and Orthopaedics. ^ Bùi Minh Quốc. Hỏi đáp về Quảng Nam-Đà Nẵng (Questions and Answers about Quảng Nam-Đà Nẵng). ^ Footprint Vietnam. Footprint Travel Guides. (2008). p. 202. ISBN 1-906098-13-1. https://books.google.com/books?id=0FKCuR0i0SMC&lpg=PA202&dq=cua%20han%20tourane&pg=PA202#v=onepage&q=cua%20han%20tourane&f=false 2011年3月19日閲覧。. ^ Lê Thành Khôi, Histoire du Vietnam, p.122, 141. ^ Ngô Vǎn Doanh, Champa, p.34; Ngô Vǎn Doanh, Mỹ Sơn Relics, p.75-76. ^ Eldridge M. Moores; Rhodes Whitmore Fairbridge (1997). Encyclopedia of European and Asian regional geology. Chapman & Hall encyclopedia of earth sciences. 19. Springer. p. 778. ISBN 0-412-74040-0. https://books.google.com/?id=aYRup5mRcGsC&lpg=PA778&pg=PA778#v=onepage&f=false 2010年8月9日閲覧。. 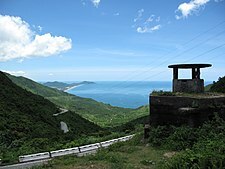 ^ "Toll rises from Vietnam typhoon". BBC. 2 October 2006. ^ 200 tonnes of rice for Đà Nẵng's Ketsana victims. Đà Nẵng People's Committee. 10 June 2009. ^ a b Danang population. Danang People's Committee. ^ "Đà Nẵng: Coastal real estate market bustling"
^ "Daewon breaks ground for first urban area on reclaimed land"
^ Lonely Planet Vietnam PDF e-book 12th editioin. Lonely Planet Publications Pty Ltd.. p. 192. ISBN 978-1-74220-582-3. ^ John Edmund Delezen (2003). Eye of the tiger: memoir of a United States marine, Third Force Recon Company, Vietnam. McFarland. p. 54. ISBN 0-7864-1656-4. https://books.google.com/books?id=AQ1hqyF1aOAC&lpg=PA54&pg=PA54#v=onepage&f=false 2010年7月14日閲覧。. ^ AACS - Air Communication. Turner Publishing. (2004). ISBN 1-56311-976-5. https://books.google.com/books?id=raDlmenz-csC&lpg=PA41&pg=PA41#v=onepage&f=false. ^ "Malaysian low cost carrier opens new international terminal in December 2011"